What Are Direct Thermal Wristbands? Direct thermal wristbands are a type of wristband designed specifically for direct thermal printers. They help the medical staff confirm that treatments or procedures are intended for a specific patient and ensure proper patient care. Direct thermal wristbands provide positive patient identification and communicate important information to the medical staff including allergies, fall risk and other medical alerts. 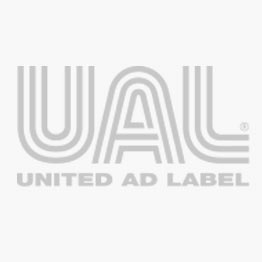 United Ad Label direct thermal wristbands offer comfort and durability. A smudge-free surface features coatings that protect the image from cleansers and hand sanitizers. The adhesive closure features security slits and is tapered to attach easily without leaving exposed edges. Each wristband generates a crisp, clear image making them ideal for printing barcodes, copy and images. Adult Patient Identification Direct Thermal Wristband, 1-1/8" x 11"
Infant Direct Thermal Wristband, 1" x 6"